"Don�t you get it? I wanna be the one sitting down with the nice looking broad while somebody serves me." Much like its central characters, Wannabes seems infatuated with obtaining a gritty approach to its story. Directed by Charles Addessi and star William DeMeo, the film effortlessly blends in pieces from a collection of better films about the mafia lifestyle but fails to inject new blood. Instead, the pieces feel stale and recycled, creating yet another in the seemingly endless line of angst-driven independent films about young hoods fighting there way to the top of the mafia food chain. Angelo (DeMeo) and Paulie (Dubin) are just another pair of kids from New York with dreams of living a life away from their dead-end jobs as waiters at a neighborhood restaurant with a mafia clientele. Soon the brothers have a plan to borrow twenty thousand dollars and get into the bookie business. In a short time the business becomes wildly successful and the two begin to delve into more serious entrepreneurial projects, up to and including running protection as well as loan-sharking. Their sudden rise attracts a local mob boss named Santo (Viterelli) who takes Angelo under his wing, much to the jealousy of Santo's real son, Vinny (D'Onofrio). What results is a bloodbath filled with double crosses and betrayals, love blossoming, and a bittersweet relationship between two brothers destined to take different paths in life. To be truthful, if Wannabes had dealt more with the events surrounding the more personal moments, I may well have been hooked. Instead, the script immerses the viewer in a world that we've all seen before to much better effect. A scene late in the film featuring Angelo and Paulie on the stoop of their Bensonhurst home is touching and handled with grace and sensitivity, but immediately following we see a trio of hoods planning on how to exact revenge. Scenes such as the latter dilute the bittersweet aspect and make it a sub par film. The performances are the sort that rise above the material and become memorable in the face of mediocrity. Both DeMeo and Dubin offer effective portrayals as brothers bonded for life, and each has a quiet charisma that will hopefully ensure prosperous careers. Viterelli does a fine job; the Analyze This actor has made a small career out of mining the same character effectively. It may be that I have grown tired of seeing the same plot dragged through the process over and over again, but there is still something about Wannabes that shows a small amount of promise. Watch it for the more personal scenes and you won't be disappointed. Image Transfer Review: Presented in a horribly cropped pan-and-scan transfer, even though it appears that the film was shot in the scope aspect ratio. Wannabes offers as average a transfer as you are likely to find. Colors are muted throughout and the image has a constant haziness. The image also shows quite a bit of aliasing throughout. Audio Transfer Review: The Dolby Digital 5.1 soundtrack is rather dull, as the mix is primarily focused on the center channel. Dialogue sounds fine, though at times it seems as though the volume for the center channel has been mixed lower than the other speakers. Extras Review: The trailer for Wannabes is featured in a nonanamorphic 2.35:1 widescreen transfer. 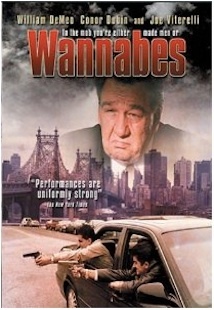 Wannabes is a long way from being considered a Mafioso masterpiece, but the cast and crew show promise. Hopefully their next project will be something very different.